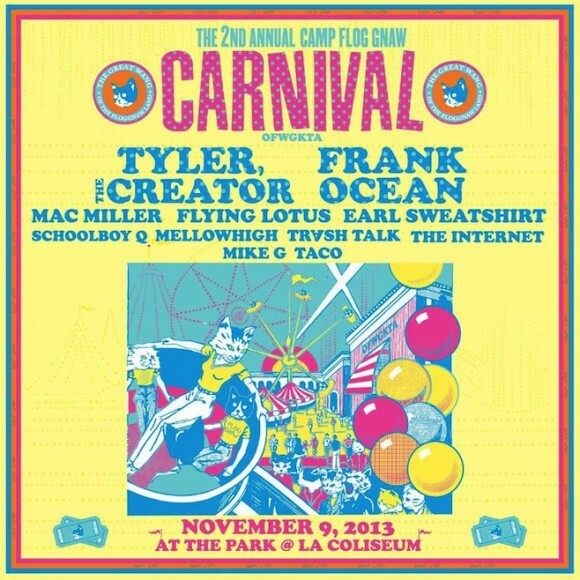 The second annual Camp Flog Gnaw Carnival (OFWGKTA) hosted by Odd Future has announced additional artists that have signed on to play the one day festival in Los Angeles at the Park at L.A. Coliseum November 9. Earl Sweatshirt, Flying Lotus (who will be featured as a host of one of GTA V’s radio stations), Mac Miller, and ScHoolboy Q are among those who will share the stage with headliners, Odd Future’s frontman, Tyler, the Creator, and Frank Ocean. Other artists on the bill include Trash Talk, Mellowhigh, the Internet (who has recently released a new streaming song), Mike G, and Taco. Flying Lotus (as his alter-ego Captain Murphy) and Earl Sweatshirt recently released a single on Adult Swim Singles with Thundercat and Viktor Vaughn (a.k.a. DOOM). Earl Sweatshirt has also recently announced a collaboration with headliner Tyler, the Creator under the moniker EarlWolf, as soon as they have time to “sit down”.